A playful slice of an authentic Italian bella vita awaits at Mio, the signature fine-dining restaurant of Four Seasons Beijing. Mio means ‘my’ in Italian, reflecting the culinary philosophy of head chef Marco Calenzo, who believes that the pleasures of eating and the comforts of home are inextricably linked. Previously executive sous chef at Apsleys in London, chef Calenzo is a wizard at the stove, whether plating recherché ingredient combinations or simply tossing a pan of hand-rolled spaghetti with chili and olive oil. It’s clear this is a restaurant with the style and the kitchen smarts to make fine dining fabulously fun — right down to a secret door that opens with a Star Trek swoosh to reveal a lavish private room, seats for a dozen diners, city views and a wall of fine wines rising well beyond reach. • The scene at Mio is a lively mix of young Chinese executives, creatives and media types, Embassy staff from the local area (the Japanese, German and US embassies are very close by) and a glut of Four Seasons brand loyalists. If you’re dining at Mio, consider yourself one of the cool kids. • Playful creativity is as much a hallmark of the food as the décor. • During lunchtime, on weekdays, a special two- or three-course business menu is available. 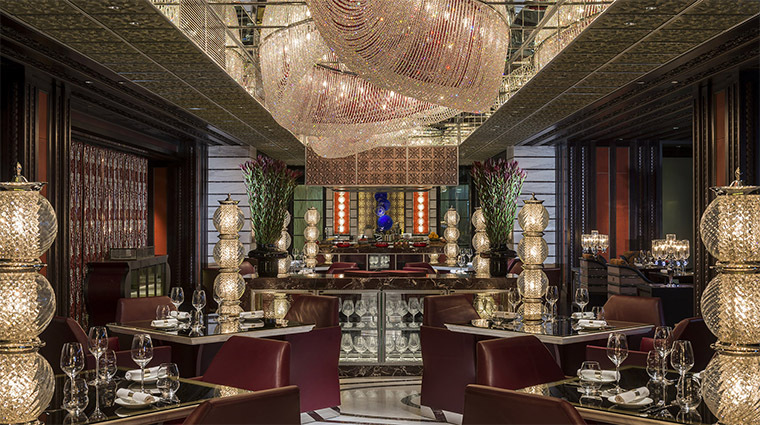 • Mio is located on the third floor of Four Seasons Beijing, the newest of the cluster of international and celebrated hotels around the northeast 3rd Ring Road. 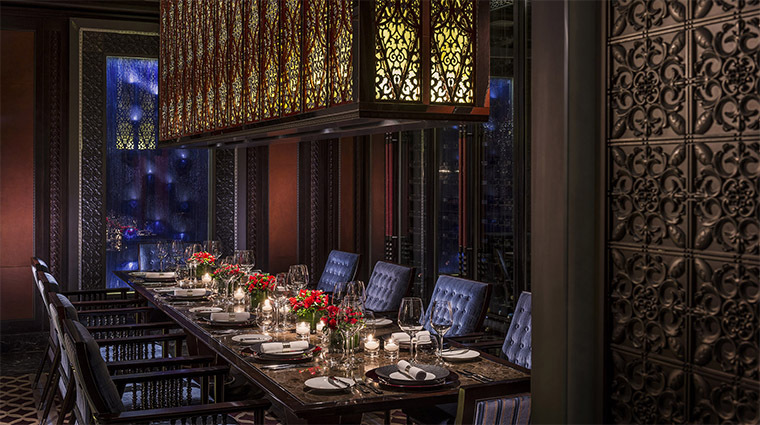 The hotel is a short cab hop from Sanlitun, the city’s best hub for shopping, dining and nightlife. It is also conveniently close to the airport expressway. • Mio doesn’t have a dress code, but to stand any chance of being seen in a place this extravagant, your attire ought to be nothing short of fabulous. • There are so many gleaming surfaces and polished white marble, that if you didn’t don a cocktail dress or suit, you’d probably wish you had put on something a little more glam after seeing the place. Even the chefs in the open kitchens are self-consciously spotless, so you’ll feel more at home here if you stick to the sartorial side of smart. 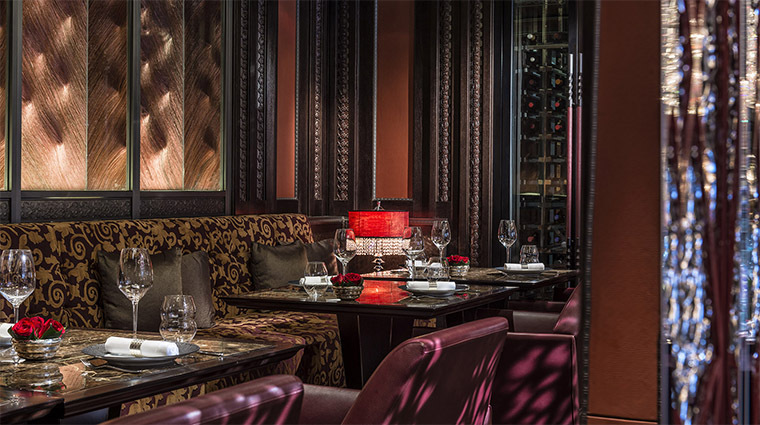 • Although you’re in the middle of bustling Beijing, the cuisine at Mio transports diners to Italy. There is a large selection of charcuterie, caviar, oysters on the half shell, and pasta. • You’ll find classic Italian favorites like minestrone soup, Caprese salad, and pepperoni pizza mingled with upscale preparations of lobster pasta and Wagyu bolognese on the menu. • Calenzo’s signature white pizza is a must order — wood-fired focaccia dough topped with a just-baked organic egg and finished with shavings of genuine Alba white truffle. Delish! • The atmosphere in the restaurant is hip and unstuffy, helped by the hustle and bustle of the chefs performing in the two open kitchens. • Tokyo-based Spin Design Studio has taken colored crystal and chrome to dazzling new heights in an interior scheme delightfully at odds with the rustic aromas of roasting tomatoes and bread hot out of the oven. 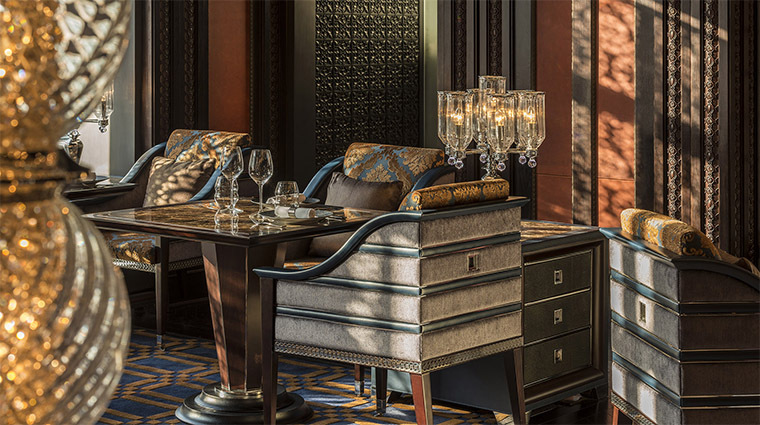 • Rich textiles abound—think navy velvet chairs, turquoise damask cushions, and buttery red leather—giving the space an opulent and royal feel.